How to be a Successful Metropolitan Law Firm if Your Clients Want Mom-and-Pop Treatment – Pacific Street Inc. So what do clients want from law firms today? Three words: value, efficiency and focus on them! If you’re not a Mom-and-Pop shop in a quaint rural township, chances are slim to none that you’ll be able to deliver all three of these perfectly (while serving up homemade cheesecake) in today’s ever-changing, stressful climate. According to the recent Law Firms in Transition Survey by leading law firm Altman Weil, the greatest challenges firms are struggling to combat and still keep smiling include stiff pricing competition and non-hourly billing arrangements, practice productivity, commoditization of legal work and competition from nontraditional legal service providers. But there are ways to become more progressive, efficient and people-friendly… and it starts with your communication tools. But not just any new software or systems upgrade is the ticket… because not all tech is created equal, let alone does it cater to the needs of YOUR FIRM. Only if you adopt and adapt to the right, customized solutions that improve your offerings can you then be empowered to give your clients more competitive rates, streamlined productivity and relationship-centered communications. Cut to the chase, CRM or Customer (Client) Relationship Management software is a versatile, comprehensive solution that every division within a firm can leverage to collectively transform its name and position in the eyes of the client. Centralized and trustworthy information (work flow, sales pipeline, etc.) for reporting the return on marketing and business development output dollars. Transparent communication which builds stronger relationships- staff, partners, clients and prospects, partnering businesses. Improved and enhanced collaboration across all divisions (staff, support, practices). More efficient work flow and insights to overspending and current firm needs. Fewer lost opportunities due to staff/partner oversights. Comprehensive, highly-detailed analytics and tracking of client service, business development and marketing initiatives. Ability to price services more competitively for the client. 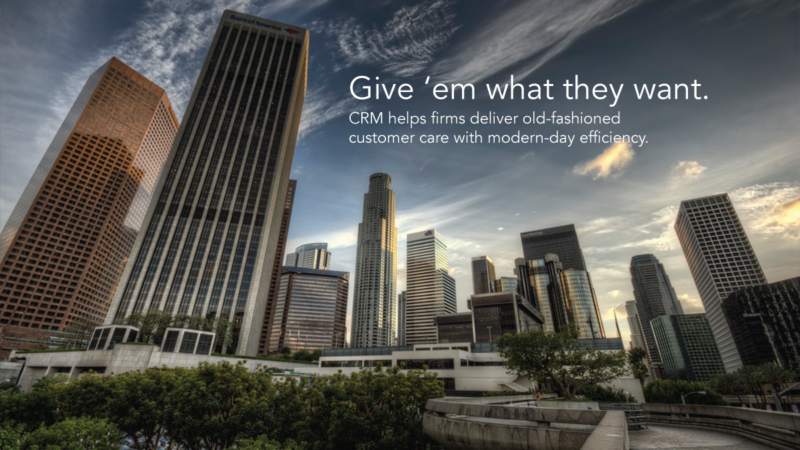 Net-net: CRM is a versatile, highly-customizable turnkey solution that can simply, effectively and immediately transforms your city-slick firm into a streamlined, integrated and progressive machine… that earns a reputation for its Mom-and-Pop client treatment.